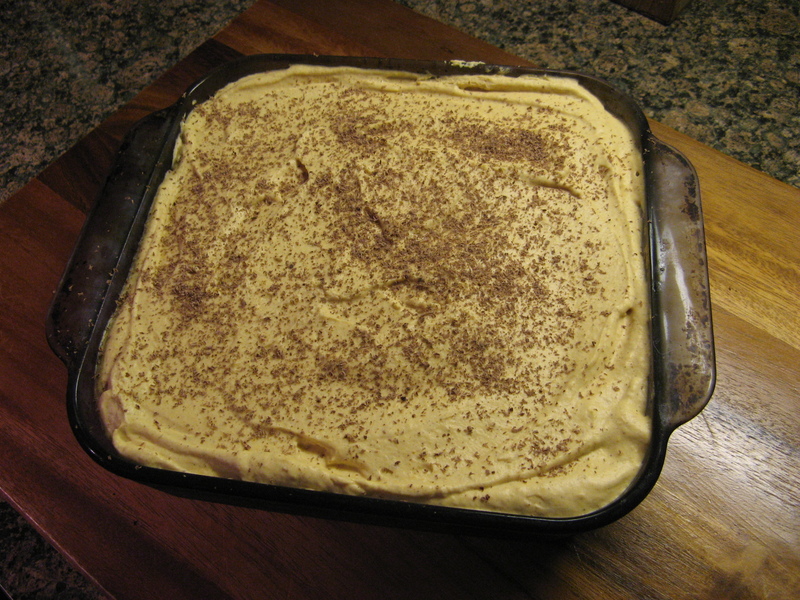 So, here’s one of those pumpkin recipes I wanted to try that I mentioned in my Pumpkin Bread post… A Pumpkin Tiramisu. About a month or so ago I started thinking about different Pumpkin desserts, not just the typical pie or loaf bread or a variation of them but something more outside the box. Hence the Pumpkin Tiramisu. You may not think it’s not too out of the box, but, how many times have you gone to a restaurant or bakery and they had a different type of tiramisu? I began by making a pumpkin mousse. In a large bowl I whisked together the pumpkin puree along with brown sugar, ground ginger, cinnamon & nutmeg, salt and sugar. Once that was well combined I added in mascarpone cheese and heavy cream and beat it with my hand mixer on medium speed until soft peaks formed. I must say, this pumpkin mousse is delicious on its own. I actually had some leftover after assembling the tiramisu and it’s the perfect fall dessert with not as much guilt. Next, it was time to assemble. Prior to making the mousse I brewed coffee (I really didn’t brew it, I just made instant – I’m not a coffee drinker) and whisked in sugar and a few tablespoons of Kahlua. After letting it cool, I soaked ladyfinger cookies in it for a few seconds and arranged them on the bottom of an 8×8 baking dish. I then spread the mousse over the cookies and repeated these two steps one more time. And voila… I covered it with wax paper and aluminum foil and refrigerated it overnight. The following day I shaved chocolate over it and enjoyed it! In a large bowl whisk together the pumpkin puree with the brown sugar, ginger, cinnamon, nutmeg, salt and 1/2 cup of the granulated sugar. Add the mascarpone cheese and the heavy cream. 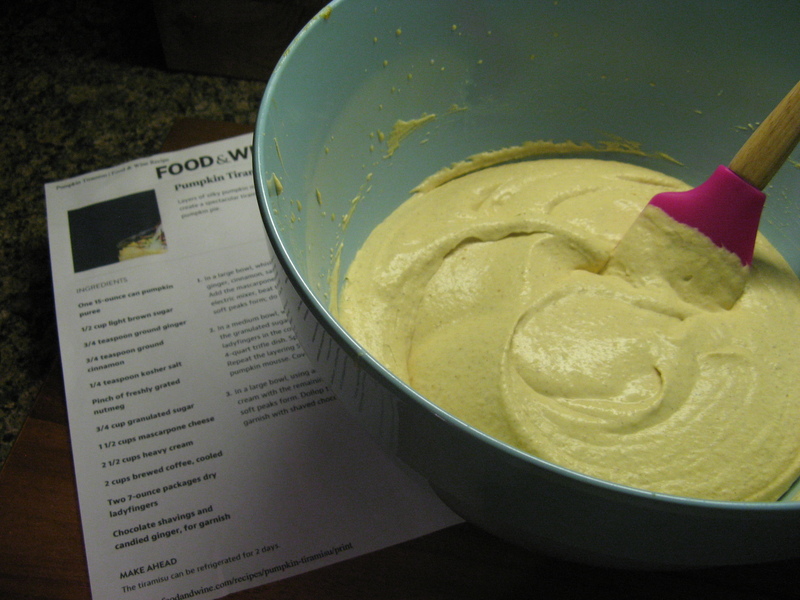 With an electric mixer, beat the mixture on medium speed until soft peaks form. Be sure not to overbeat. In a medium bowl combine the coffee, 2 tablespoons of sugar and the Kahlua and whisk together until the sugar dissolves. 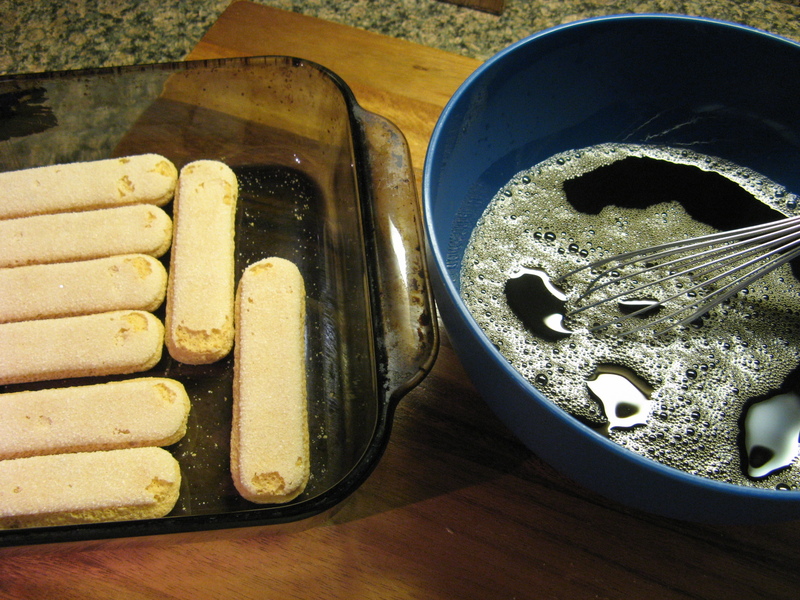 Dip half the ladyfingers in the coffee mixture and arrange them on the bottom of an 8×8 baking dish. 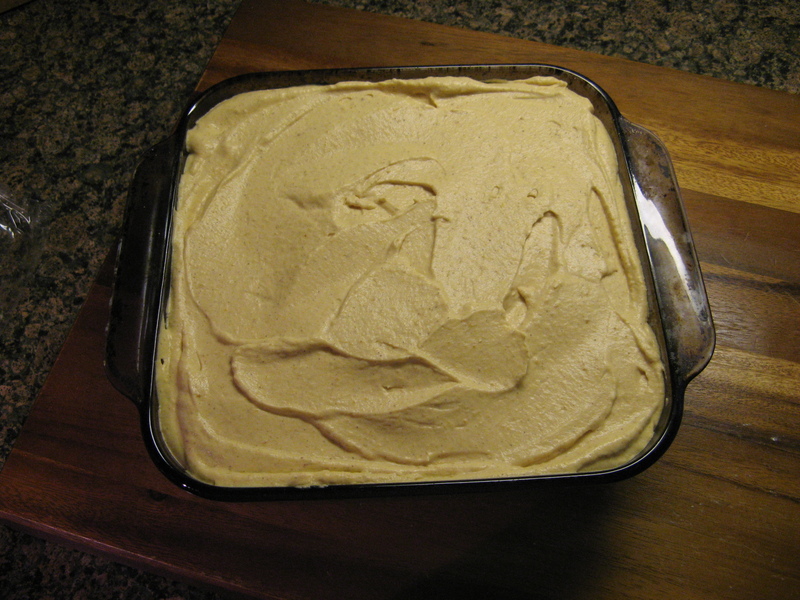 Spread a generous amount of the pumpkin mousse over the ladyfingers. Repeat these two steps cover and refrigerate overnight. You will have some mousse leftover. Prior to serving garnish the tiramisu with the chocolate shavings. Honestly tiramisu is one of my favorite desserts. Such an indulging taste. Great recipe!